Lithops are one of the most popular of all the succulents. These fat, cheeky little succulents plants have been grown for decades by amateur and professional succulent lovers alike. Lithops are dwarf, succulent mimicry plants comprising two thick fleshy semi-translucent leaves resembling stones. These leaves fuse together at soil level where they taper down to a single carrot-like structure which eventually becomes the root. The flattened top part of the leaf is window-like. This window performs a very important function, allowing light to enter the plant body where the sun's rays activate cells which assist with photosynthesis. The upper surface of the plants are of a varied and translucent nature: some have speckled lines, are grooved, or even spotted. Lithops plants come in a variety of patterns and colours. When the plant starts to flower, the bud emerges through the groove between the two leaves. Flowering time is generally during the months of March, April and May (southern hemisphere). Flowers are solitary and are borne on a short stem. All lithops are noon-day flowering plants. Basically this means they only flower when the sun is shining and from about 12 noon. Flower colours are white and yellow, rarely orange. Seeds are produced during the months of November and December (southern hemisphere). In most cases the seed capsules are five- or six-segmented. They are hydrochastic, i.e. open when wet. In nature they open when it rains, the seed being dispersed by raindrops. Seeds are very small and can vary in colour. Lithops species have a very wide distribution. They occur mainly in the western, drier areas of South Africa. However, they are known also to occur just outside Johannesburg and even in parts of the central Free State. 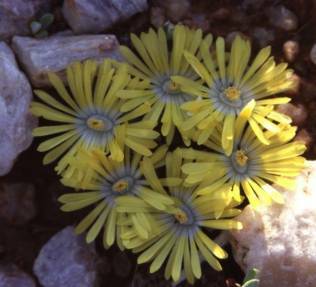 Lithops species are also found in Namibia — one species even occurs on top of the Brandberg in central western Namibia! They are true survivors, tolerating extreme heat (above 42°C) and relatively low winter temperatures of -5°C. The plants appear to have a wide tolerance of habitats, growing in quartzite pebble pavements, on dry, stony slopes or flats, calcrete soils and even in open patches in grassveld. 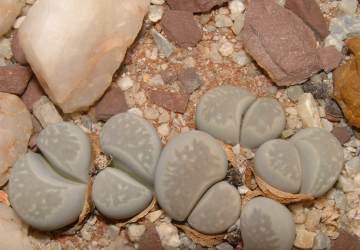 Lithops species can, under ideal conditions, live for about 50 years in cultivation. In the wild the original parent plants probably don't live much longer than 25 years. Lithops is derived from the Greek lithos meaning stone-like or stone appearance. Hence the common name, living stones! Pollination is often through bumble bee-like insects, mainly in the afternoon and early evening. It is possible that moths also contribute to the pollination process, especially the late afternoon. Another interesting phenomenon is that during extreme droughts, lithops plants can pull themselves into the soil to such an extent that they actually become semi-subterranean! In this way they are not exposed to the harsh outside elements that could dry them out even further. Some Lithops species have been collected by herbalists, especially those species growing close to metropolitan areas, some as a food source others for medicinal purposes. Lithops plants are easily cultivated from seed and also grown by means of cuttings. Seeds are produced annually in November and December (southern hemisphere). The seed must be completely dry. Normally the seed capsules are pale brown in colour when they are ripe. To extract the seed, merely break open the seed capsule with your fingers. The fine seed can be decanted into a small envelope. For best results sow the seed in a well-drained substrate: coarse sieved river sand (1 mm in diameter) can be used. It is not necessary to cover the seed: the seeds are very fine and any topping or layer of soil over the seeds is likely to hamper their development. Just keep the substrate moist to stop germinating seedlings from drying out. The ideal time to sow the lithops seeds is during the months of March, April or May in South Africa, when seeds would germinate in the wild, especially of those species from the western parts of South Africa. The seeds germinate relatively quickly. In just under a year they are ready for transplanting: use a well-drained substrate to plant the young seedlings in. One may also decorate around the plants with quartzite stones, thus enhancing their natural appearance. Water young seedlings four times a week during hot weather. A watering of once a week during winter should suffice. Whilst the seed is germinating, use a very fine mister when watering. Any spray head that produces large water droplets will wash the seed away. Lithops can be grown from cuttings. One must be very careful to remove all dead tissue away from the base (root). Strike the cuttings during warm weather in coarse sand. The ideal time for preparing the cuttings is in March, April, September or October. Under warm conditions the cuttings root quickly. Cole, T.D. 1988. Lithops, flowering gems. Acorn Books, Randburg , South Africa .